I’m one of those people who hates how early Christmas starts these days. Settle down now, hear me out. I absolutely *love* Christmas. It’s definitely my favourite time of the year! Well, apart from my birthday. And Summer. And any days when it’s really, really hot. Okay, what I meant to say is that Christmas is my favourite holiday of the year. And that’s definitely true. I love the magical feeling, and the extra kindness people seem to show for each other (apart from when they’re fighting the queues in the shops to buy that one mass-produced thing that is a truly unique gift that about several thousand other people will also get. Ahem). I love the presents and the decorations and the tree. I love carols. But what I don’t love is how even from September, Christmas decor and gifts and such start appearing on the shelves. WE HAVEN’T EVEN HAD HALLOWEEN YET, PEOPLE. Step away from the tinsel! My anticipation for Christmas only really starts in December. I usually don’t even put my tree up until a couple of days before Christmas. Yes, I’m a terrible person. What can I say, I like the magical build up – but I like to at least get November out of the way first. It’s perhaps for that reason that I’ve always struggled to make Christmas cards anytime before mid-November. My brain just isn’t in the right place for it, and no amount of playing carols or Christmas songs out of season is gonna change that. But then that evil crafty genius, Catherine Pooler – I don’t know what she did to me. I think she cast some kind of spell on me or something. We’re getting close to the witching time of year, so that’s what I’m going with. So, this spell. Whatever it is… she seems to have unlocked and broken my mental block in creating Christmas cards ahead of season. She has me humming Christmas carols even though it’s only October. October! Crafty witch. 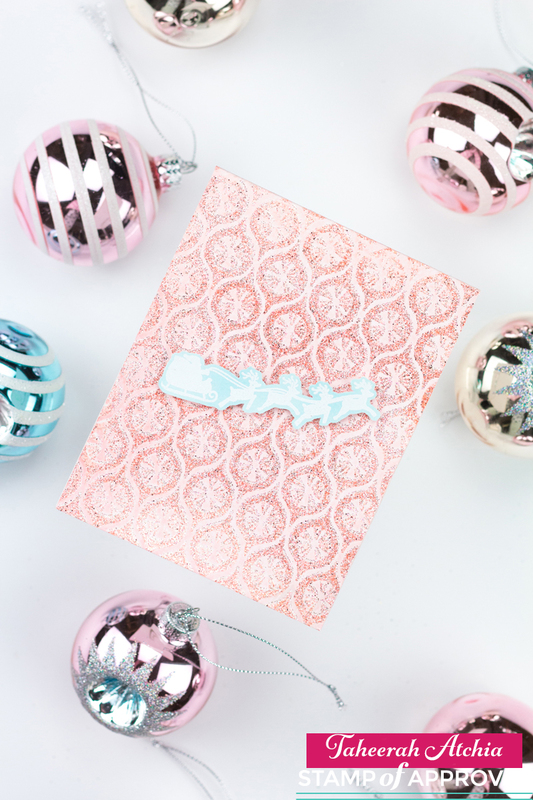 And she did it, with her wicked crafty, spell-casting ways, with the brand new Stamp of Approval Collection that’s all things Christmas in a box. If you’ve not heard of Catherine Pooler’s Stamp of Approval then you are in for a treat. 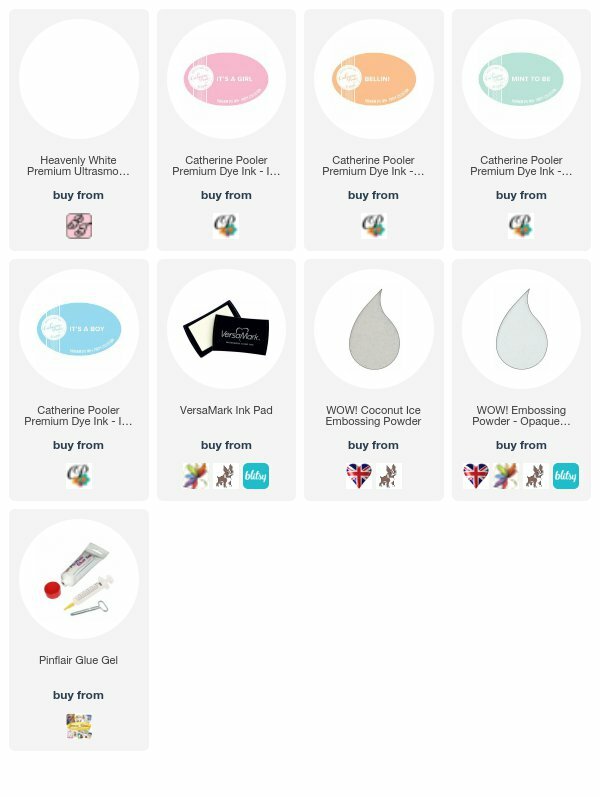 It is a completely curated box of exclusive supplies delivered right to your doorstep! 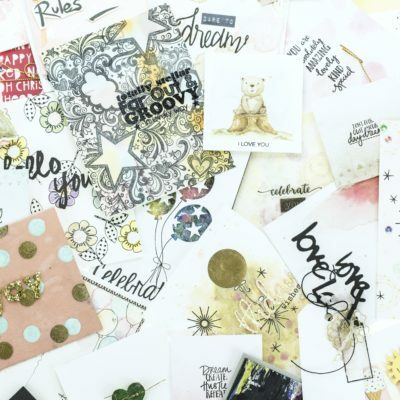 Amidst the gorgeous box and hidden in that pretty wrapping is an *awesome* collection of not-yet-on-the-market stamps, dies, and maybe even a couple of other surprise goodies too – all expertly designed and selected for each box to match, coordinate and amaze. The products in each box are only available as an entire collection and won’t be offered for individual sale until several months from the Collection’s release date, so they’ve got that whole exclusivity thing going on. AND just like that Christmas Morning/surprise gift, the first time you see the entire contents of the box is when you unwrap it for yourself! How fun is that?! Oh, and one more thing. You know that mad dash for Christmas presents that leaves decimation and empty shelves in its wake? Exactly how the stampede goes for these babies. That’s right. If you want to be the first in line when those doors open then I recommend subscribing to the Waiting List at Catherine Pooler’s Stamp of Approval site so that you’re notified when the collections go on sale. Otherwise you might be opening your stocking and finding coal, not crafty awesomeness. No-one wants that. Now, outta my way. I’ve got to go put turn this place into Santa’s Grotto. 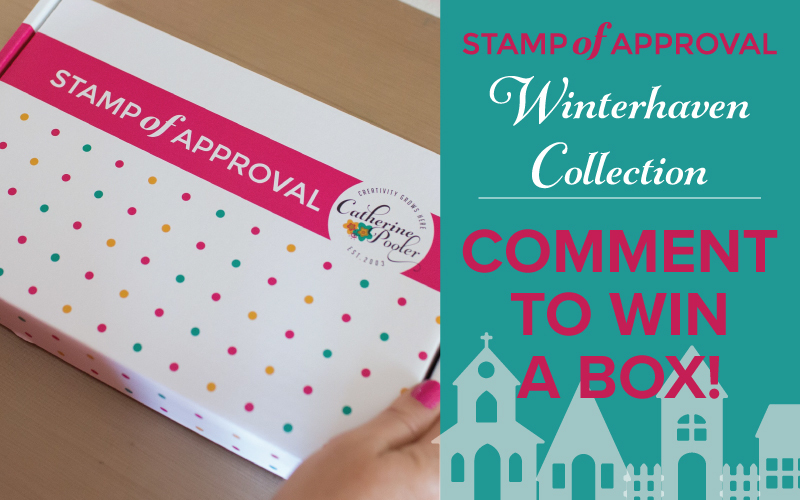 The latest Stamp of Approval Collection is being released in just a couple of days and it’s called the Winterhaven Collection. This collection, oh my. I have a serious weakness for Christmas stamps, and it’s like Catherine probed my brain to find out exactly what would be the weakest spot of my weak spot and turned it into a collection!! Catherine has been sneaking peeks of the contents of The Winterhaven Collection on her blog over the last few days, and the past couple of days have seen the amazing Design Team (and some special guests!) show off just what some of the items in the collection can do! I’m helping to bring up the rear for Day 3 of 3 Blog Hops to show off this *truly* amazing box of goodies with a couple of cards, and of course there’s a fantastic giveaway as well where you can win a box of your own too! Let’s get to the cards. We’ll start with this stunner, shall we?! I wanted to show you that even though the stamps and dies in this collection are more on the modern side, they can still be used to create a card which is totally vintage in nature! I started by stamping the music stamp from Here We Come A-Caroling set all over my card panel to create a background. I added some smaller stamped detail too, like the cluster of little dots and stars, and a larger star, to build up the design. I splattered some mist for some shimmery detail, and stamped the green dot clusters using a mix of Grass Skirt and Icing On The Cake inks. 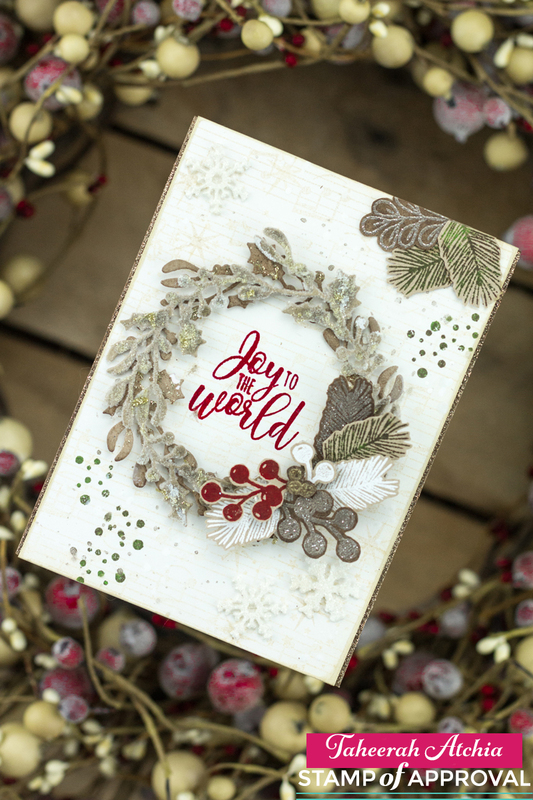 Next came those stunning wreaths – part of the Joy Wreaths die set in this collection! I die cut it twice from kraft cardstock. With the lower wreath I emphasised the browns by blending a little Icing On The Cake ink to the edges, and rubbing on a little gold glimmer paste. With the top wreath I coated it in Distress Glitter, a few touches of gold glimmer paste too, and a few splashes of Picket White Distress Paint for ‘snow’. I worked out where my wreaths would be positioned on my card and used that to position my sentiment. I stamped that using a mix of Rockin’ Red and Icing On The Cake inks. Basically, although the inks in Catherine’s collection are super bright, you don’t have to stick to them being so! By adding the brown to the mix, I was able to get a deeper, richer, more vintage red! Next up – more details to decorate that wreath! 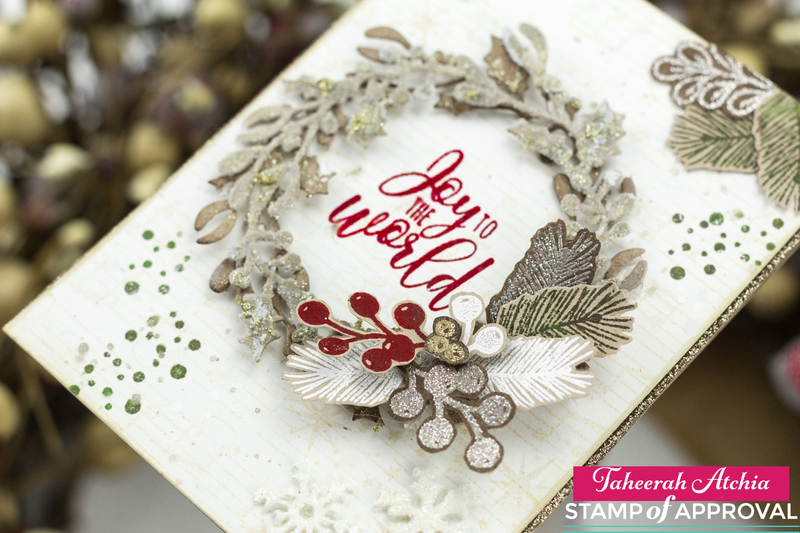 I stamped a bunch of sprigs, berries and leaves from the Tis The Season set onto kraft cardstock. Some were in that deep red, some in that deep green, and some in Versamark. The Versamark ones were heat embossed with either white or sparkly platinum embossing powders, depending on the look I wanted. For the platinum ones, I sponged some Icing On The Cake ink over them to deepen the effect. I trimmed all the elements out by hand – there is a coordinating die set that is an add-on to the collection, so if you don’t love fussy cutting as much as me, you might want to get that too, hint hint! Just check out that dimension! The wreaths and all its decor were adhered in place using dimensional glue gel – there’s some serious height off that card base! We’re in the home stretch now, I promise! I adhered some more of the stamped/embossed leaves to the top right corner of my card, to add a bit of balance. I also die cut some snowflakes using the Good Stuff dies, coated them in glitter too, and adhered with dimensional glue gel. Finally, see the glittery gold base? I used the same glimmer paste to jazz up my card base – then dabbed Icing On The Cake ink over it to make it a more vintage gold – before adhering my panel on top! Seriously in love with this baby! I hope you don’t blame me! A totally modern, pastel colour scheme and look! Can’t get more different than that! I started by stamping the fabulous Ornamental Background stamp with a mix of It’s A Girl and Bellini inks, stamped off once before stamping to my base. I then stamped over it again, very slightly offset, with Versamark ink, and heat embossed with a shimmery sparkly embossing powder – oh you should see it in real life! I very lightly blended some It’s a Girl ink over the panel. Then I used a little trick. I spritzed the panel quite a bit with water, then dabbed with card with a tissue to remove most of the colour, leaving a beautiful pale pink behind! The santa is from Here We Come A-Caroling, and was heat embossed in white embossing powder. 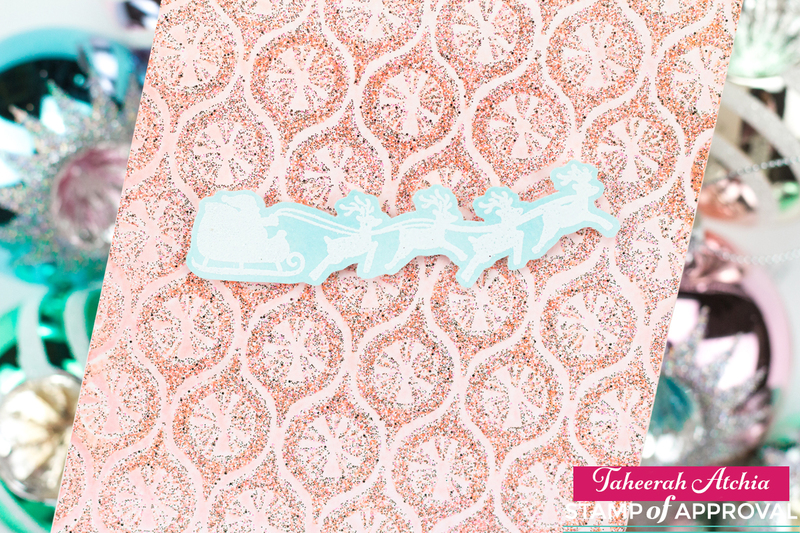 One of the things I love most about photopolymer stamps is that they can be curved/bent to not be straight – that’s exactly what I did with this stamp to make Santa look like he was flying up! I created the pale aqua cardstock using the same blend, spritz and dab technique as for the card base, but using It’s A Boy and Mint To Be inks instead. Love this trick! Santa was trimmed out and adhered with dimensional glue gel to finish. 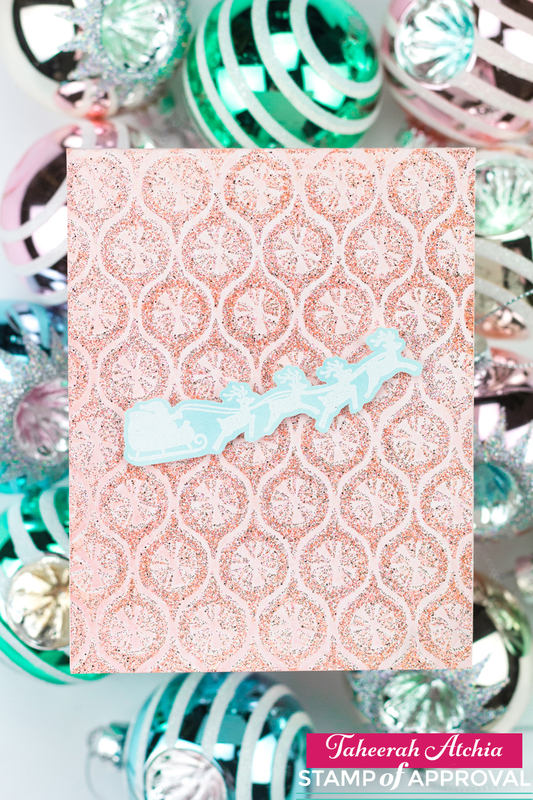 This card reminds me of sugary sweets and all things delicious! I hope you love it too! So I bet you’d like to win one of these amazing collections for yourself, right? Read on! All you need to do to be in with a chance of winning is leave me a comment – and then make sure you visit the other hop destinations too to check out the amazing inspiration and increase your chances of winning by commenting there too! Here’s your Hop line-up for today! As I mentioned, this is the third of three Blog Hops – and each day’s Hop has a box to give away! That’s three boxes up for grabs for three very lucky winners – and the more you comment the better your chances, so be sure to comment on every single stop of every single hop! And if you’ve already bought a box, you’ll win a $100 gift certificate instead! You can head back to Catherine’s blog to get the list for the other two days! You have until 9am EST on Wednesday 11th October to enter. Good luck! 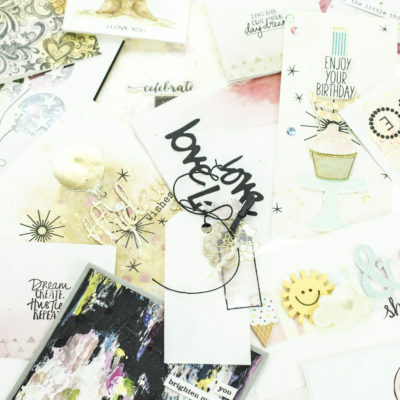 And don’t forget that The Winterhaven Stamp of Approval Collection goes on general sale tomorrow! In fact, I’ll be back with another post then to remind you! Evil crafty genius! Spell-casting! I’m dying! That is so funny. Your cards certainly have a magical quality to them as well. The vintage style wreath is a show stopper for sure. And the pastel sugary goodness makes me want to start my Christmas baking. Just Beautiful! That wreath is seriously GORGEOUS! Your wreath card is exquisite, love all the little details! Thanks for the inspiration! Love the vintage wreath card – very elegant! Wow and double wow! I love the amazing wreath. You are very talented and so creative. I can not wait to get my hands on this collection of goodness. Thank you for sharing. Wow! That wreath (which I’m crazy about) card is fabulous and so unique. Thank you for sharing. 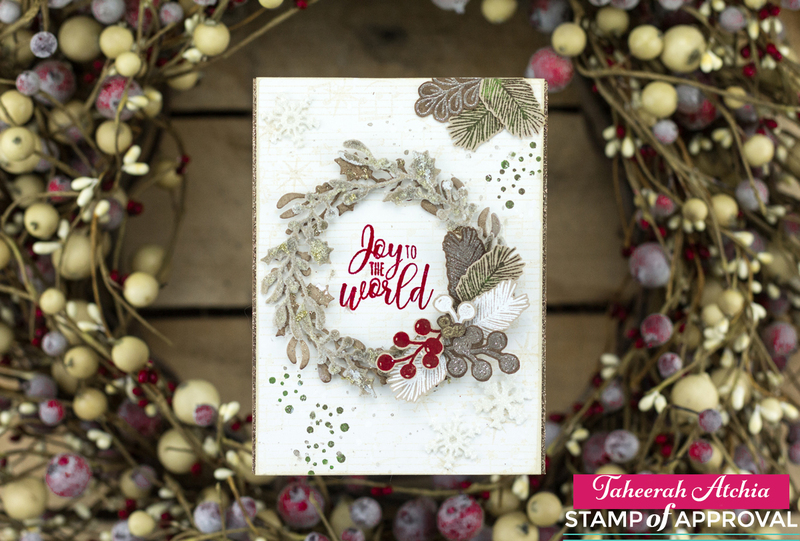 Your wreath card is fantabulous! Love the layering of the wreaths and the texture on the glittered one! Love your first card. What singing a Christmas carol early can do to the card world. The pink card didn’t do it for me. That’s what I get for being a traditionalist! Stunning! 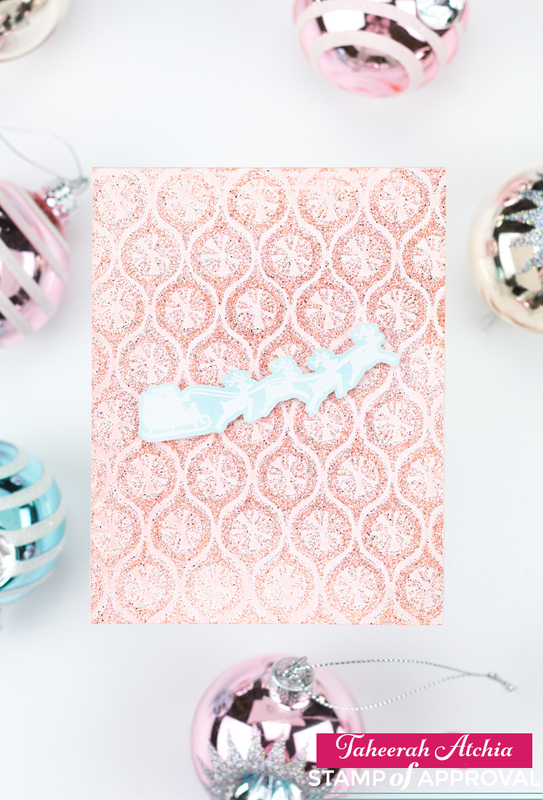 Your wreath card is my absolute favorite of the Blog Hop. Your talent is amazing. Love how you did the wreath card. Your cards are totally awesome!!! I love the techniques that you used which were “out of the box”. Beautiful!!! Your designs are gorgeous. Love, love , love the natural look of your wreath. I can’t wait to get my hands on this fabulous box of goodies. I agree Catherine has cast quite a spell on so many of us, but i have to admit I love it! And….I love you cards and the first card is just amazing! Thank you for sharing it and how you did it with us. Beautiful! Stunning wreath! Your combination of colors is exquisite. Thanks for sharing! WOW, your designs are AMAZING!!!! Love your beautiful cards! Thanks for the chance to win this awesome collection!!! I simply ADORE your style. 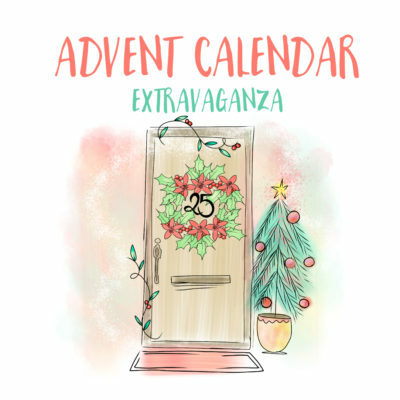 I’m a fan addicted to your 25-days of Christmas blog hop. 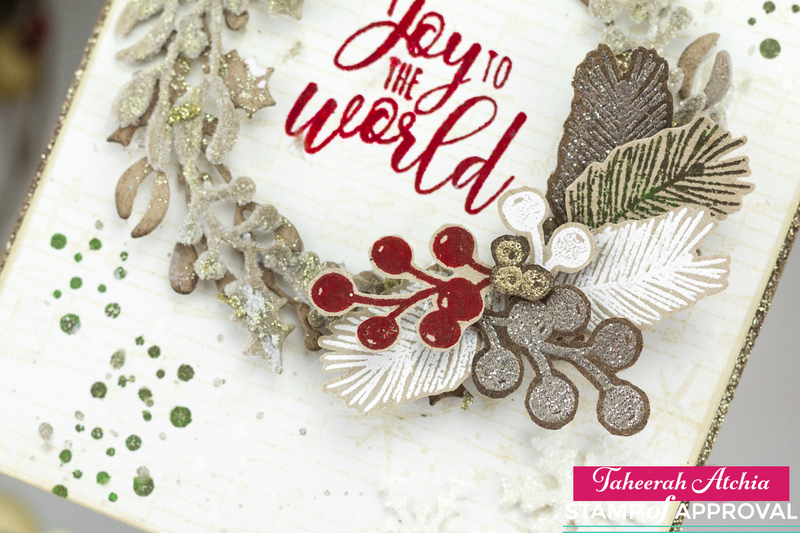 What’s also super fabulous about your cards – is that you show what inspired you – from the wreath to the ornaments. And you are so funny in your writing. LOVE IT. Love you. 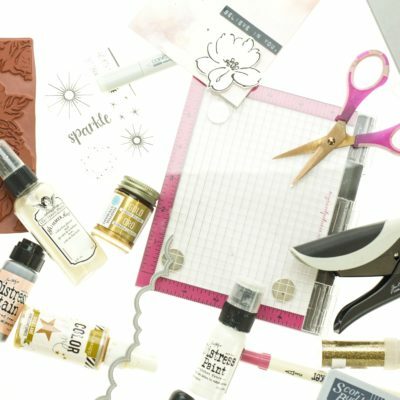 Love your crafty inspirations! Great cards. Love the texture on the wreath card. Very pretty. WOW!!! 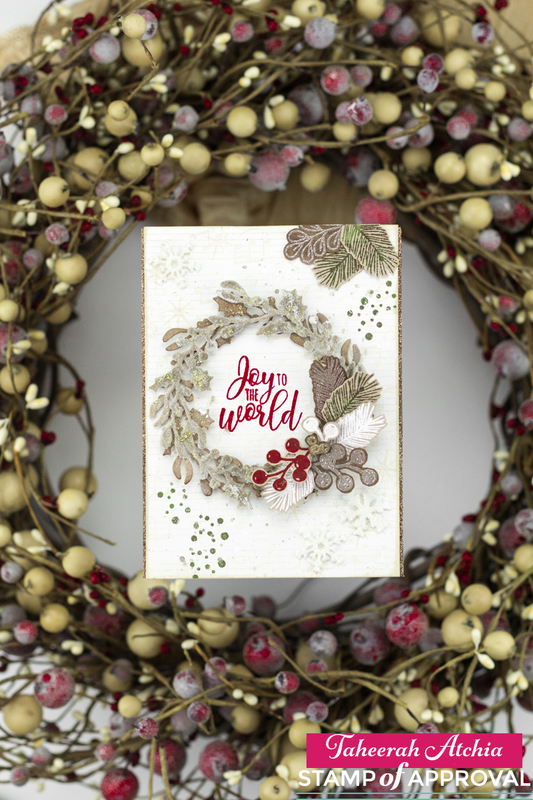 Your wreath card is simply beautiful! I can’t wait to give it a try! I am literally DYING over that wreath, girl! LOVE it!! I am continually blown away by the variety of cards the design team comes up with! Love this collection! 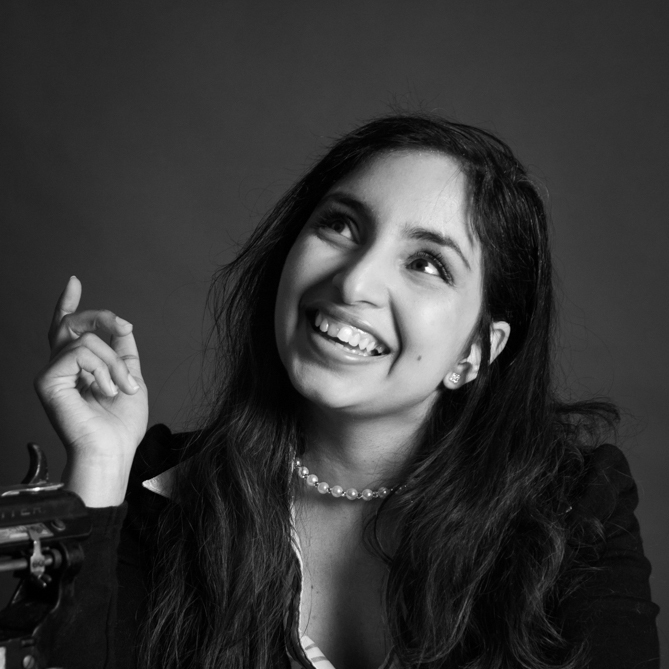 Taheerah- Gorgeous! Absolutely Gorgeousl! Both cards are masterpieces! The definition in the first card- and the softness of the second. Thanks so much for the inspiration!! Wow! Your cards took my breath away. So elegant and stunning. You did a wonderful job. Amazing cards!!! This collection is my new favorite. Thanks for sharing!!! I would love a video for that first card! it’s gorgeous! Wow! Awesome cards and colouring!!! All the deatails are so flawless!!! Absolutely love your wreath card! The double layers really made it pop and your color palette is gorgeous. I agree, though, about that crafty witch Catherine; her collections are more and more enticing every time she releases one. I agree with you that Christmas starts so early! It is my favorite holiday too. I love your first card. It does look very vintage. What I really love was you calling Catherine a “crafty witch”! That made me laugh but it is so true. Stunner is right! These are gorgeous!!! Enjoyed reading your intro to the cards! Glad the crafty witch did a spell on you as your cards were outstanding! I love how organic and natural your cards look, especially that first one! That wreath card is so amazing and elegant! Love it! Such great commentary. I love Christmas too, but agree it is much too early cause our family loves Halloween as well… Great card ideas, all I can say is wow! Nope no one can blame you for being in love that first card is off the charts gorgeous!!!!! Too gorgeous to mail away, I think you should frame it for holiday decor! Would love to win that set, I won’t be able to do it justice but I can have fun trying!! I love the wreath card. It’s gorgeous! Loved your dialogue and your cards are stunning! OMGEEE! Taheerah you are the cherry on top!! 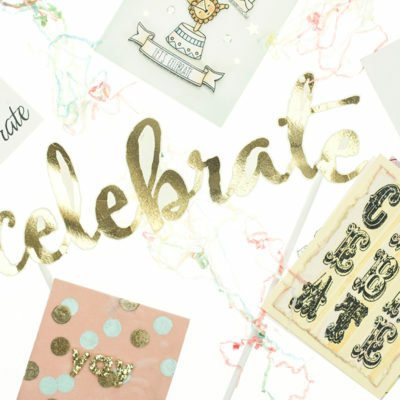 What a fabulous way to end this blog hop!! I am stunned by your creations and I want to copy EVERYTHING! WOW WOW WOW ! That first card is amazingly elegant and just stunning! I totally agree that Christmas stuff starts too early, which is probably why I procrastinate until the last minute with my holiday cards. Maybe this box would give me jump start I need this year, you think? 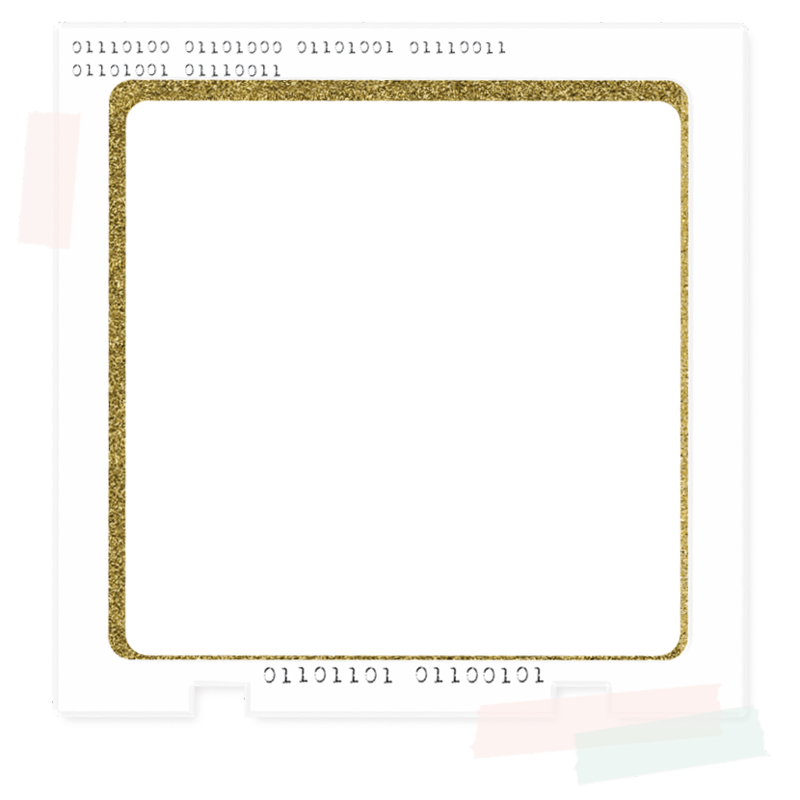 Your cards are gorgeous, I love that sparkle and glitz on the first one, very elegant. “Crafty Witch” HAHAHA! Love your cards!